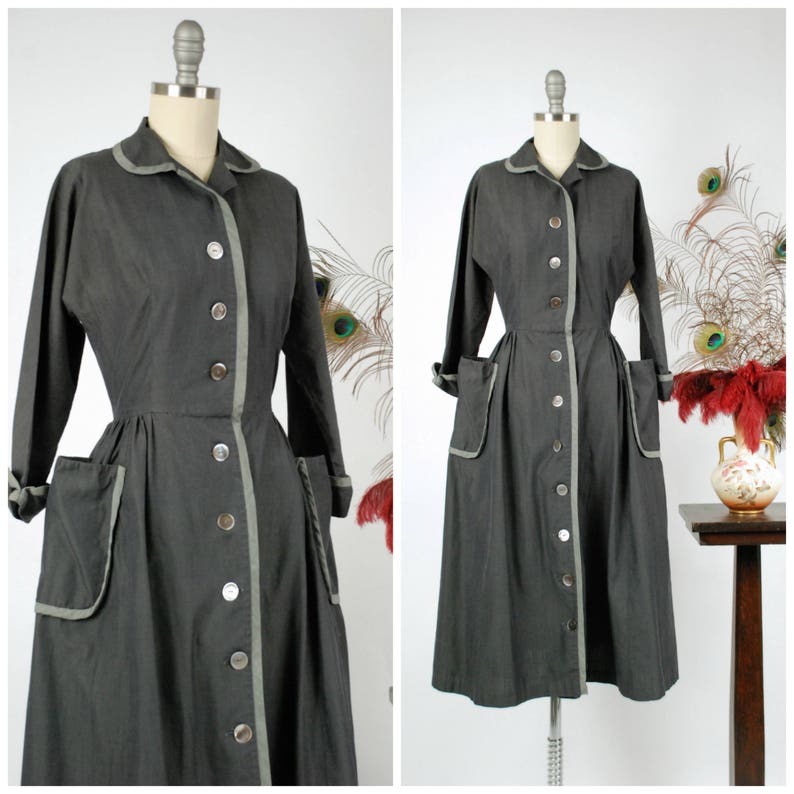 Vintage 1950s day dress is fabulous in a sturdy, steely grey cotton. This subtle but incredibly smart dress is dramatically fit and flare in shape, with a skirt that doesn't need a crinoline to look full. The dress is a classic button front style, with shell buttons that climb from hem to collar. The round collar and button placket are trimmed with a lighter grey hue, as are the massive hip pockets. These pockets stand away from the skirt, emphasizing the dramatic fit n flare silhouette. Perhaps the best part, though, is the back view - heavy, tight pinchpleating around the back yoke and waistline. This sturdy cotton is the kind of basic that you'll return to over and over - solid, striking, and simple. This dress fits smaller that the measurements seem to indicate - it was bit large for the size 0 mannequin, but too snug for a good fit on the size 6 form. The buttons were moved by a previous owner to fit the current size, and should be set back to their smaller size. 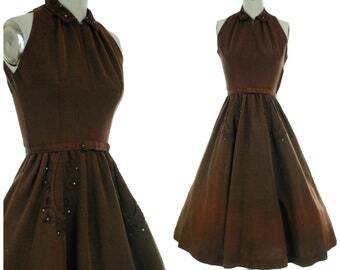 This dress is freshly hand cleaned and ready to wear. There is about a small bit of seam under the left arm that has been hand stitched in the past. As stated, the buttons have been moved. I find no other issues to note!